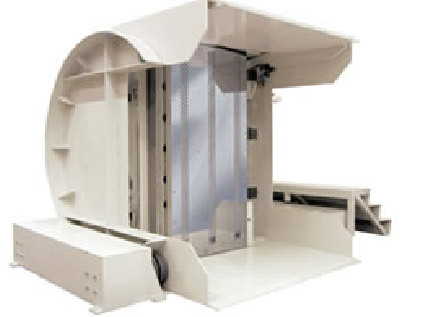 Toppy range offers mobile and stationary pile turners, complete of air and vibration system, for the turning, aligning, cleaning and drying of cardboard and thick paper. The air and vibration flow can be adjusted according to the customer’s necessity. The wide and flexible range of Toppy pile turners guarantees the utmost quantity and quality performance. Toppy roll turners are self-propelled reel lifters, suitable to handle reels of different sizes and materials, in order to optimize the production performance, to ease the operator’s job and to increase the operator’s safety conditions. 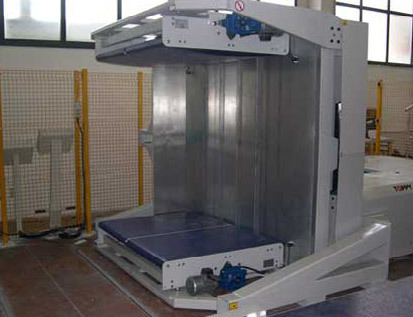 It is possible to choose among mobile or stationary roll turners. The reel can be either gripped from the outside diameter (“Toppy Web” roll turner) or from its core, through a suitable expanding spindle (“Toppy Aspo” roll turner). Toppy Kompressor is an electrically powered pile turner, designed to turn, move and align pallets of cardboard up to a maximum weight of 1000 kg and with size from 50 x 70 cm to 76 x 106 cm. Toppy Kompressor pile turners include a built-in air turbine supplying the right quantity of air for a deep drying and cleaning of the product. The vibrating system allows a perfect alignment of any single sheet. 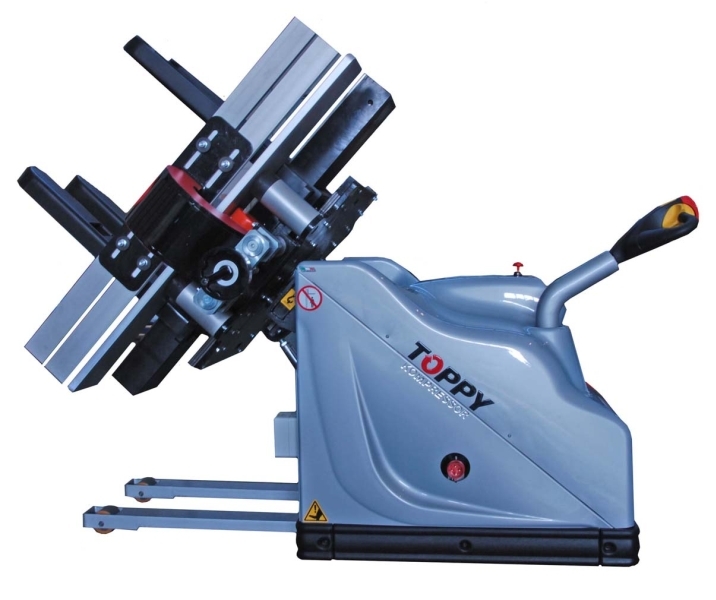 Toppy Twister Silver AJ is a stationary pile turner, designed to turn, blow and vibrate pallets of thick paper or cardboard up to a maximum weight of 1000 kg and with maximum size 80 x 112 cm. Thanks to the push-button panel close to the pile turner, any operation can be carried out manually. Thanks to the push-button panel placed near the pile turner, any operation can be carried out manually. Toppy Twister 1600 AJ is a stationary pile turner, designed to turn, blow and vibrate pallets of thick paper or cardboard up to a maximum weight of 1500 kg and with maximum size 125 x 165 cm. 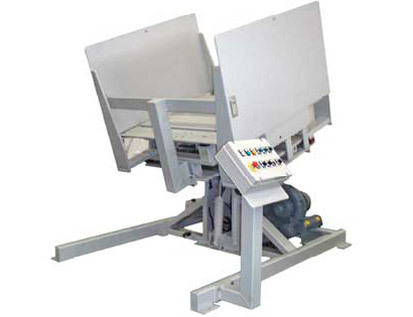 Toppy pile turners can be either operated manually or automatically. 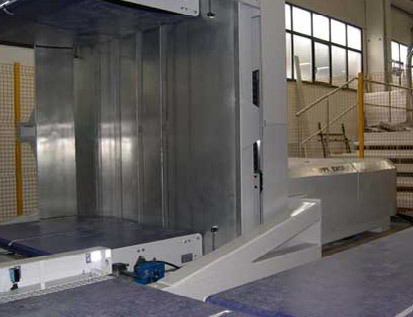 The manual model features a push-button panel placed near the pile turner; the automatic model features a PLC enabling to select the most proper working cycle, according to the kind of pallet. Toppy Excel 2000 AJ is a stationary and programmable pile turner, designed to turn, blow and vibrate pallets of cardboard, plastic and other materials up to a maximum weight of 1800 kg and with maximum size 145 x 205 cm. It is possible to select any single working cycle through a touch screen PLC panel. 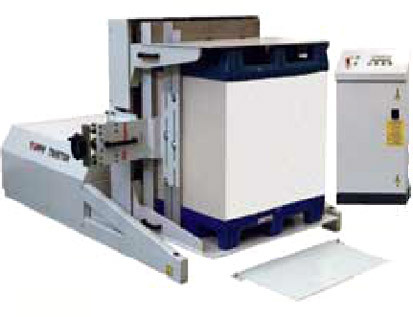 Toppy Excel 2000 AJ pile turners can become part of a logistic system and be connected to offset printing machines, die-cutters, coupling machines, in order to optimize the working processes. Master Toppy AJ is a stationary, full automatic pile turner, designed to blow and vibrate pallets of cardboard up to a maximum weight of 2000 kg and with maximum size 100 x 140 cm. (Master Toppy AJ1400) or 120 x 160 cm. (Master Toppy AJ 1600). 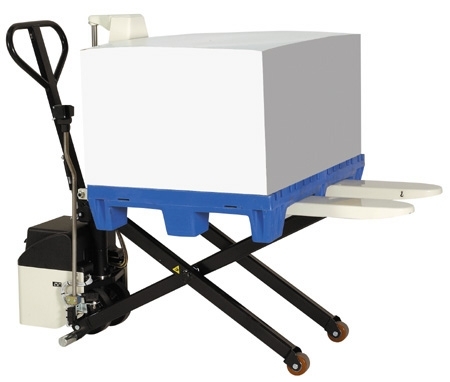 Master Toppy AJ pile turners can be loaded with a simple pallet jack, without any need of floor pit: the load platforms, in fact, can reach the floor level. The air flow will guarantee the dust removal and the separation of any single sheet. Thanks to the vibrating system, the cardboard sheets will be aligned. Toppy Web 600 is a reel turner able to turn by 90° reels of paper with a maximum weight of 600 Kg and maximum diameter of 1270 mm. 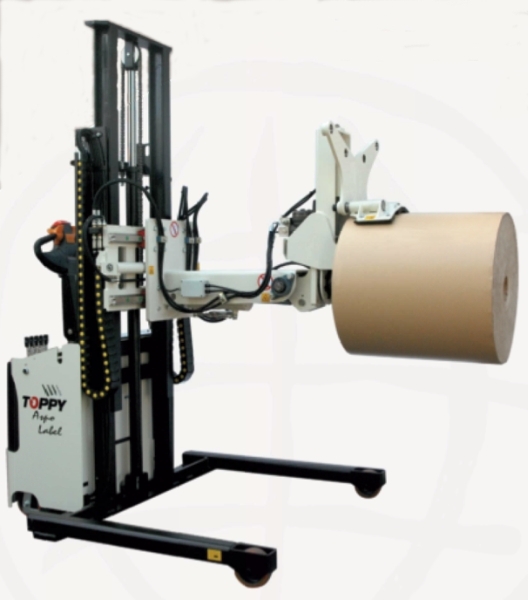 Toppy Web 600 enables to take single paper reels from piles arranged on a pallet, move and turn them so that the operator can easily place them back into the rotary press. The reel can be also put on pallet, waiting to be placed into the printing machine. 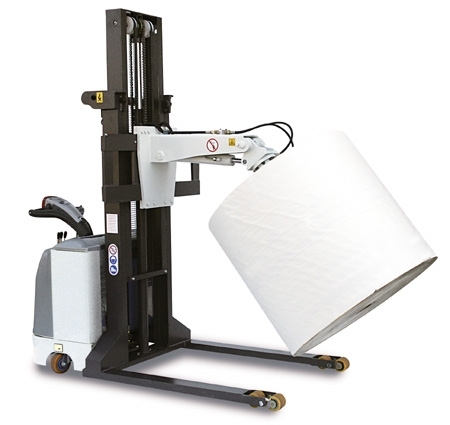 Toppy Web 600 roll turner is available with either manual or electric traction. Toppy Web 1000 is a mobile reel turner with electric traction, able to turn by 90° reels of paper with a maximum weight of 1000 Kg and maximum diameter of 1270 mm. 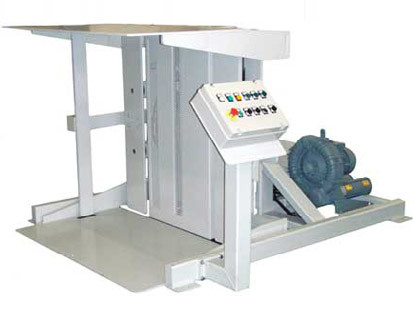 Toppy reel turners enable to take single paper reel from piles arranged on a pallet, move and turn them so that the operator can easily place them back into the rotary press. The reel can be also put on pallet, waiting to be placed into the printing machine. Toppy Easy Aspo roll turner is a minilifter with manual traction and electric lifting. It can handle and rotate by 90° reels of different materials, up to 100 Kg of weight. Through a spindle made of elastic rubber. The spinde has manual drive. Toppy Aspo 300 is a reel turner mobile, battery operated truck designed to handle reels of different materials, weighing up to 300 Kg. Toppy Aspo 300 can take a reel placed vertically on pallet, turn it and place it horizontally onto the floor, and viceversa. The reel is taken from its core by a spindle, that expands for a safe and strong grip. 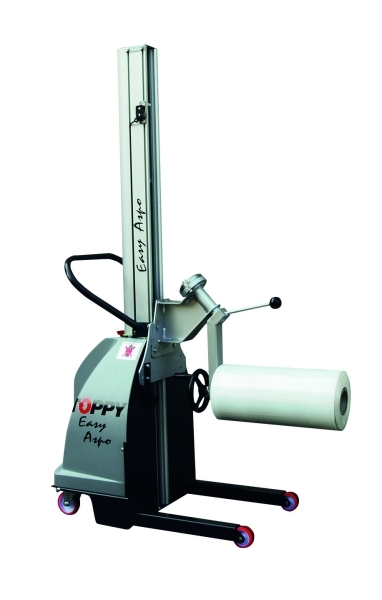 Toppy Aspo Label roll turners have been conceived to avoid the cone effect when lifting the reel thanks to a hydraulic clamp which tightens the circumference of the reel, becoming one with it. Toppy Aspo 600 is a reel turner mobile, battery operated truck specifically designed to handle reels of different materials and weigh up to 600 Kg. It is available with either manual or electric traction. Toppy Aspo 600 roll turner can take a reel placed vertically on pallet, turn it and place it horizontally onto the floor, and viceversa. The reel is taken from its core by a spindle, that expands for a safe and strong grip. Toppy Aspo Label 600 is a mobile reel turner, battery operated truck specifically designed to handle reels of different materials and weigh up to 600 Kg. It is available with either manual or electric traction. Toppy Aspo 600 can take a reel placed vertically on pallet, turn it and place it horizontally onto the floor, and viceversa. The reel is taken from its core by a spindle, that expands for a safe and strong grip. 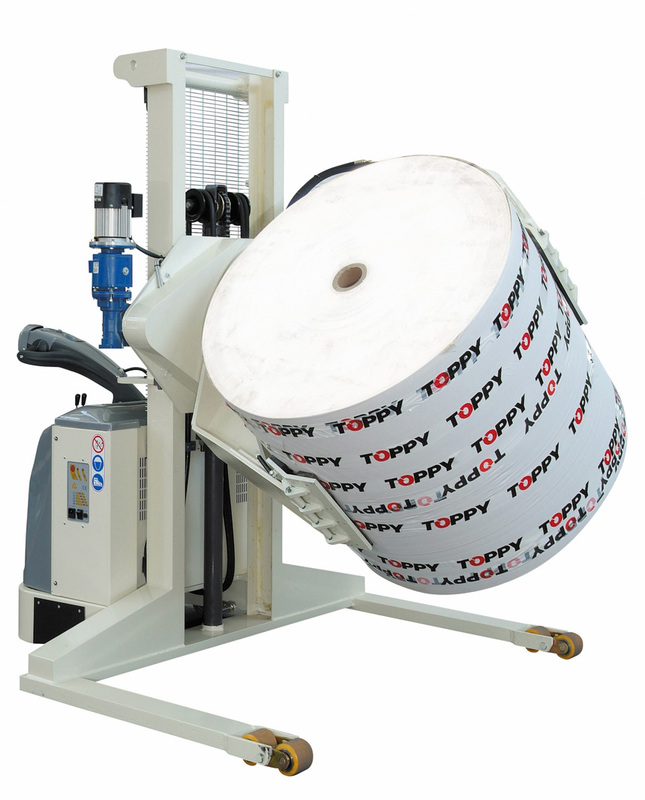 Toppy Aspo Label 600 roll turner has been conceived to avoid the cone effect when lifting the reel thanks to a hydraulic clamp which tightens the circumference of the reel, becoming one with it. 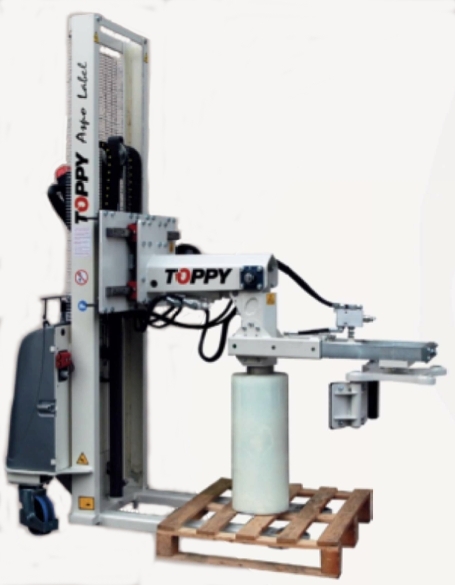 Toppy Eye is a combination stacklift and pallet truck, battery operated hydraulic system, that easily transports and lifts heavy loads to an ideal working height. Toppy Eye lifts the loads by means of an hydraulic cylinder with a chromed piston, controlled by a built-in oleodynamic electronic unit. This pallet jack is equipped with a photocell that makes it automatically go up or down according to the load height.